Everyone needs to get out of the house to take care of life’s normal business. With handicap hand controls, people with disabilities can drive using just their hands. These hand controls are best suited for those who have impaired functioning of their legs but still have the physical dexterity in their hands. 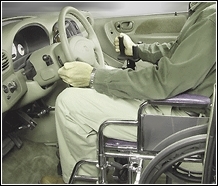 One option in handicap hand controls is a vertical handle that mounts on the console between the driver and passenger seats. The handle connects to the accelerator and brake pedals. It includes turn signals, and is also available with buttons for the windshield wipers, horn, and dimmer switch. This product is designed for a vehicle with automatic transmission, and is meant to be permanently installed. 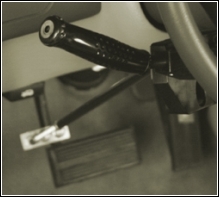 Another product available in handicap hand controls is a temporary handle that attaches to the accelerator and brake pedals with brackets and wing nuts. This is convenient if the driver wants to rent a car. The handle installs in about ten minutes. The disadvantages are that it must be installed on a vehicle with automatic transmission, power steering, and power brakes, and it also requires some arm strength to use. In order to accelerate, the handle is pulled backwards and to brake, the handle is pushed forward. These installations do not affect the regular pedal controls of the vehicle. These vehicle hand controls work by simplying bolting them to the gas and brake pedals. Make sure the pedals are flat on both top and bottom for a tight gripping fit. The best part is these handicap hand controls can be easily removed and stored when not in use. 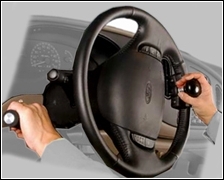 For those who do not want a handle, another handicap hand control is a knob that mounts on the vehicle’s steering wheel. 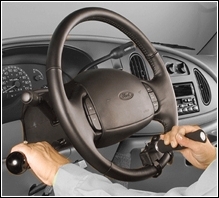 These steering wheel handicap hand controls also known as a spinner knob or steering wheel knob, attaches to the steering wheel and helps those with limited hand strength to drive and turn without straining the arms or shoulders. Some knobs come customized with buttons and flip switch controls for the accelerator, brake, turn signals, horn, and dimmer switch. This solves the problem of reaching for these controls. It is also convenient for non-handicapped drivers who might drive the vehicle as these knobs take up very little space. Most handicap hand control devices cost from five hundred dollars up to the thousands but the driver’s medical insurance may pay for them. There are also grant programs and dealer reimbursement programs that can help. 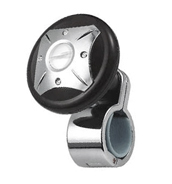 Those with limited range in their arms and shoulders will find spinner knobs a perfect accompaniment to their car steering wheels. You will soon find yourself with an easier driving experience and have increased maneuverability, especially during sharp turns. Handicap hand controls can allow people to get to work and other places without purchasing costly handicapped equipped vehicles or hiring handicapped transportation. For an increased quality of life, they are worth the price and time to consider. It is best to consult your doctor and test drive a vehicle with these controls before considering a purchase.